Slightly more than one kilometer across the Ma Wan Channel from the south shore of the western New Territories of Hong Kong lies Ma Wan Island. On this small island, Sun Hung Kai Properties Ltd is a resort community with residential housing, commercial centers and a theme park. They expect over 15,000 people to eventually live in the new development. Currently, there is a fishing village on the island. The village’s potable water needs are served by a single 8 in (200 mm) diameter water line. This line was placed on the channel bottom in 1988 amid much difficulty. The swift current, irregular channel bed topography and heavy traffic from bulk carriers, barges, ships, high speed ferries and fishing crafts made the pipe laying tough. To install more water lines for the new development and not have to deal with these problems, Golder Associates (HK) Ltd. Designed a construction system that would employ horizontal directional drilling as the principal method for burying new water lines in the Ma Wan Channel. An alternative to the massive horizontal directional drilling was sea floor trenching and tunneling. However, it was projected that trenching and tunneling would create more problems and expense than drilling. Horizontal directional drilling was chosen because of its minimal impact on the environment and its ability to not interfere with marine traffic. The entire construction would be free of hazards like dragging anchors of passing boats. But during the early stages of the project, this method required some help from another technology. The path for the twin, side-by-side, 12 in (300 mm) diameter HDPE water mains would be from the pier at Angler’s Beach on the mainland to a recently constructed reclamation area at Pak Wan on the north shore of Ma Wan Island. At Angler’s Beach, the land elevation and the angle of descent for the horizontal directional drilling rig necessitated that the launch site be inland, away from a very busy beach frontage road called Castle Peak Carriageway. Although only a two-lane road, Castle Peak Carriageway carries large volumes of traffic as it parallels the coast of the New Territories. The planners wanted to use some other method to bore under the roadway for the first 98 ft (30 m), not only to avoid disrupting traffic but also to avoid causing any road settlement. Road settling was the primary concern when the planners selected pneumatic pipe ramming as the method by which they would install the 54 in (1,370 mm) casing from the launch site beneath the carriageway, the sea wall and Angler’s Beach. The first and foremost reason for using a large casing was to collect and conduct large amounts of drilling fluid. The fluid was to be used with a mud motor system that was employed to drill through the bedrock under the Ma Wan Channel. Second, and of equal importance, the large casing would reduce the risk of drilling fluid breakout during the horizontal drilling stages of the job. 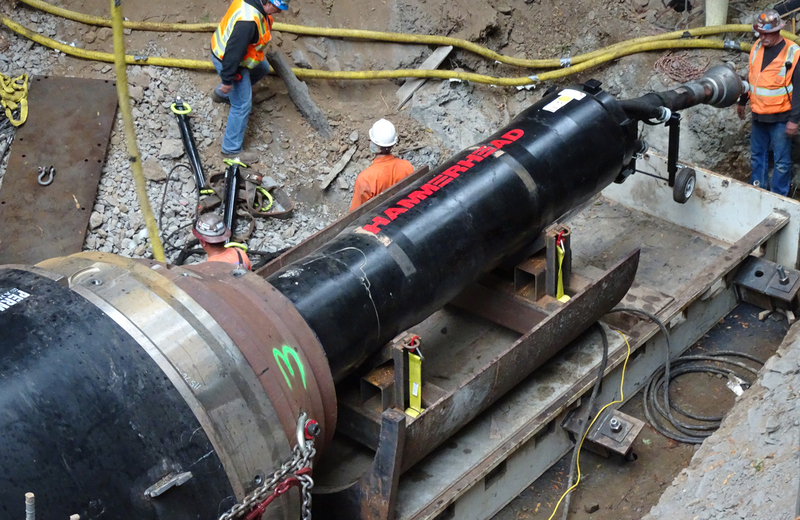 According to the designers, pipe ramming with a large pneumatic tool is a method used to cross under roadbeds without creating voids in the substructure under the road. As the pipe is rammed open-ended, it cuts through the soil. Only a small amount of soil is displaced, and this soil is swallowed inside the pipe. After the pipe is completely in place, the soil is removed. To be absolutely sure that there were no voids, 18 settlement monitoring points were set up along the existing Castle Peak Road. After the ramming operation, it was determined that no settlement occurred at any of the monitoring points. To set up for the pipe ram, a 30 ft x 30 ft (9 m x 9 m) pit was dug, leveled and poured with concrete. Then a loading platform was erected with steel guiding rails. The 12 ft (3.6 m) lengths of casing were set at a 20° angle of descent to match the angle that would later be followed by the horizontal directional drilling unit as it drilled to find its maximum desired depth under the channel. This was another reason why pipe ramming with the 23 in (580 mm) diameter HammerHead pneumatic pipe ramming hammer was appropriate for this job. Unlike any other method, once the pipe was set on the rails and the adapter ring and collets the tool could be lifted and set into the collets and the pipe rammed at this 20° angle without any bottom or back wall steel support. To complete the set-up process, a cutting shoe was fabricated on the site and was welded onto the lead pipe. This 2.5 in (64 mm) wide band provided additional internal and external clearance between the soil and the pipe, easing the ramming process. This cutting shoe cut through the sand, clay and cobble soil between the launch site and the point where the ramming stopped and the horizontal directional drill rig took over. Once the adapter ring was strapped onto the casing and the collets were set in place, the tool was lowered and its own hammering action locked into the collets. The percussive impact of the tool was transferred to the outer ring of the casing driving it into the earth. Powered at 110 PSI (76 kPa) with large compressors generating 1,700 cfm (48.2 m3/min), the pipe ramming was the fastest part of the operation. The first 24 ft (7.2 m) of the large casing was rammed in after only 15 minutes. The welding of the next 10 ft (3.1 m) section took the rest of the day. The next section was rammed in place in an equally short amount of time. Then the crew turned its attention to the twin casing and followed this same process to ram in the second casing, which was positioned next to the first. The team had been given 10 days to complete both 66 ft (20 m) pipe rams; they completed the task in six days. 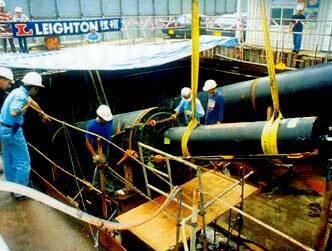 The intended length of the pipe ramming was to be 98 ft (30 m) for each of the casings. At the 66 ft (20 m) mark, the casing hit bedrock. It was the time for the horizontal directional drill rig and the rock boring mud motor system to take over. When the rig was set up, a small auger flighting section was added. With the rotational power of the big rig, the spoil that had collected inside the rammed casing was cleaned out. As a prelude to the large horizontal directional drilling work, pipe ramming proved to be a complementary boring technology and was totally effective in accomplishing the engineering firm’s objectives.